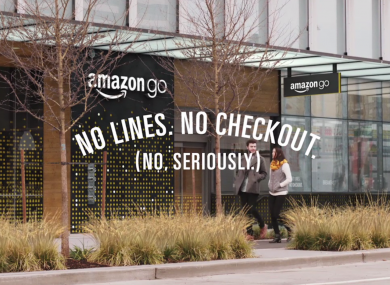 AMAZON HAS UNVEILED a new kind of retail store – with no cashiers or checkouts. Customers at the concept store in e-commerce company’s hometown of Seattle, Washington, can fill their shopping carts and walk out with the costs automatically tallied up and billed to their accounts with the US online giant. Amazon Go, which is being tested with Amazon employees and will open to the public next year, is a “checkout-free shopping experience made possible by the same types of technologies used in self-driving cars: computer vision, sensor fusion and deep learning,” its webpage said. The 1,800 sq ft (170 sq m) store is selling a variety of food products, including bread, cheeses and ready-to-eat meals, as well as Amazon meal kits, which contain ingredients for home-cooked dishes. It was not immediately clear whether Amazon will expand this model with more physical stores or offer the technology to other retailers. The online giant has been rumored to be looking at creating brick-and-mortar stores but so far has only announced a handful of outlets selling books. The Wall Street Journal cited people close to the matter as saying that Amazon Go was one of several store formats the retail giant is considering. Two prototype, drive-through locations in Seattle without in-store shopping options are set to open in the coming weeks, the Journal reported. Depending on the success of the test locations, Amazon could reportedly open more than 2,000 brick-and-mortar grocery stores under its brand. If it does push forward with selling fresh food in stores, Amazon could put a lot of pressure on traditional grocers and superstores like Wal-Mart. Email “Amazon is opening a bricks-and-mortar store - with no cashiers or checkouts”. Feedback on “Amazon is opening a bricks-and-mortar store - with no cashiers or checkouts”.